Wilson Farrow (left) allowed a run over four innings and senior Bryce Frederick had three hits, leading No. 7 Dulaney past 20th-ranked Catonsville in Baltimore County baseball action Tuesday afternoon. The Lions have sole possession of first in Baltimore County’s Division A. 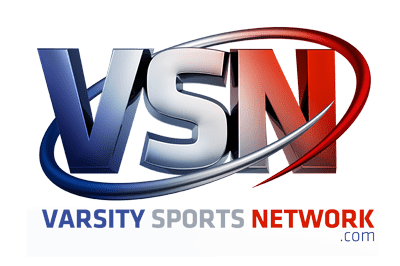 An insurance run or two can be a huge investment in a close game and two of them paid off for 7th ranked Dulaney High at Catonsville Tuesday afternoon as the visiting Lions escaped with a 5-3 victory over the No. 20 Comets in a big Baltimore County Division A contest. The result enabled the defending county champion Lions (7-1 overall) to remain the only undefeated team in the division at 6-0, followed by Towson (4-1), Catonsville and Hereford (3-2 each). Dulaney and Catonsville are two of the county’s younger teams in 2019. 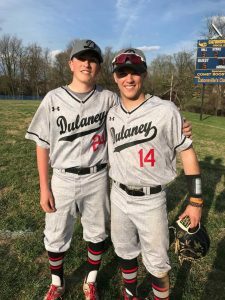 Dulaney took a 3-1 lead into the seventh inning at Catonsville and added two “insurance runs” on a two-run dinger by lefthand hitting Reid Bark to make it 5-1. The Comets staged a two-out rally in their final at bat as Mark Brady’s third knock of the game brought in a run and sophomore Nick Elswert doubled in another to make it a 5-3 game. Elswert’s shot to right center just missed by a couple of feet of going over the fence. With runners on second and third, Dulaney coach Ryan Wolfsheimer came out to the bump and summoned junior righthander Will Farley to replace lefthand reliever Cole McGee. Farley ran the count to 3-2 on the Comets’ cleanup batter and starting pitcher Will Jones before striking him out swinging on a breaking pitch. Had the Lions not added the two insurance runs in their last time up, they might still be in extra innings with the Comets (5-2). “This is a really good win for us and it came against a helluva ball club,” said coach 11th year coach Wolfsheimer. “They (Catonsville) can hit the baseball. They’ve been averaging eight, nine runs a game. We knew we had to keep them off balance in order to compete with them. Dulaney had gotten four strong innings from junior righthander Wilson Farlow to start the game. Farlow had good command of his breaking pitch holding the Comets to three hits and a run while striking out six and not walking a batter. He retired the first eight men he faced, striking out four in a row. The Comets did not have base runner until two outs in the third as they singled three straight times with the last knock by Brady producing a run. After pitching a scoreless fourth inning and his team leading by 3-1, Farlow surprisingly did not come out for the fifth inning and was replaced by McGee, who would pitch two scoreless innings before getting into deep trouble in the seventh. “My pitch count was getting up a little bit and we had other guys in the pen who had a little more energy than I did,” Farlow explained why he was pulled. Dulaney had scored two of the early runs in the first inning against Jones, a 6-foot-5 righty. The senior pitched just three innings and was followed by three Comet reliefers. Brian Ellis singled in one of the runs and the other scored on an error and the Lions go their third run in the fourth on a fielders’ choice. Bryce Frederick, the Lions outstanding shortstop and four-year starter who will play at Radford University next year, was 3-for-3 with a double on the day and is now 11 knocks away from the school career hits record of 101 set by his cousin Alex Frederick. In his four years at Dulaney, Bryce Frederick, who coach Wolfsheimer says is “a once in a lifetime player,’: says this team might by the youngest and most inexperienced, but the underclassmen are getting better each time out. The Lions will have to because the Comets are already looking forward to playing them at least one more time. Not only will the Comets and Lions battle again in the division, but possibly in the Class 4A North Region playoffs where No. 1 Howard is the defending region and 4A state champion. Wilson Farlow, Cole McGee (5), Will Farley (7) and Finn Drew; Will Jones, Ben Hall (4), Kevin Alberg (6), Mark Brady and Sam Brown.